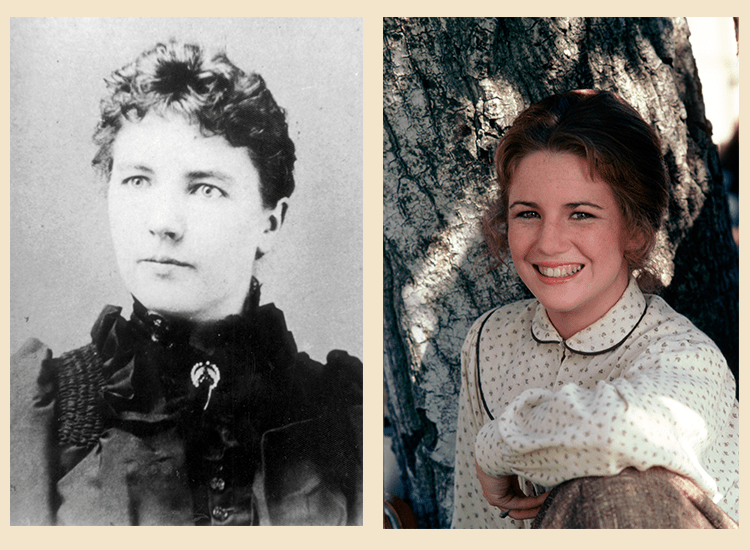 Thanks to the cozy, warm, and affectionate portrayal of the Ingalls family across all kinds of media platforms around the world, many people think of Ma, Pa, Mary, Laura, Carrie, Grace, Almanzo, and even Jack the bulldog as part of their family. However, that raises the question of what version of the Ingalls family people relate to most. The prairie is a little crowded. There is the real life Ingalls family, the version in the books, the NBC television version, the ABC miniseries version, the version in the musical, and those in the pageants just to name a few. Charles had a wandering foot in all his various incarnations. In real life his family had long been farmers, moving several times while he was growing up in search of a better chance. Charles followed this same pattern with his own family after marrying Caroline Quiner, always in search of better financial opportunities, specifically a successful wheat farm. After many moves and attempts, with his family’s help Charles proved up his homestead, but due to health issues, he retired from farming almost immediately afterward. Together Charles and Caroline built up one final home in De Smet, South Dakota. It’s known in Laura circles as the Third Street House and is where Charles and Caroline spent the rest of their respective lives. 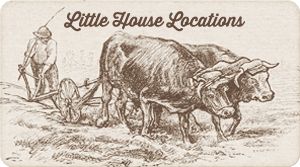 The Little House books simplify and streamline the various moves, leaving out things like Charles’s deal to pre-empt a tree claim in Walnut Grove and then resell it a few days later. They also leave out the family’s financial problems. 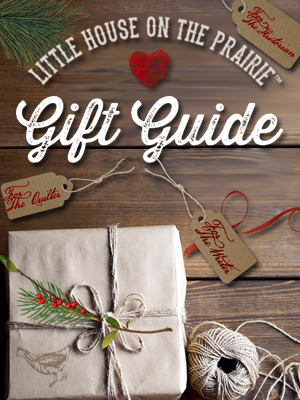 The books don’t portray the handouts the family received from the Minnesota state government during the grasshopper plague emergency and from the Dakota territorial government for Mary’s tuition to the College for the Blind. On the NBC TV show, Charles and the Ingalls family were a far more permanent part of the community. For the majority of the episodes, they stayed firmly entrenched in Walnut Grove, Minnesota. Played without an attempt at Charles’s famous beard, Michael Landon remains the embodiment of Pa for many people around the world. Caroline was raised in a blended family after her father went down in a shipwreck on the Great Lakes and her mother later remarried. Life was hard during those years and Caroline expressed a longing for stability. Caroline married Charles Ingalls and, drawn on by his efforts to make a better life for her family, she was pulled from “pillar to post” as goes the expression her book character uses. Caroline was a strong pioneer woman, willing to do what she had to do to keep the family going. She valued education, having attended an academy “back east” near Milwaukee, and tried to keep the family in fashion as best as she was able. Book Caroline was pushed farther within the Victorian ideal than real life Caroline. While Ma’s neighborliness, her creativity in desperate times, and education were described in the books, definite limitations were placed on her character to make a starker contrast between Ma’s character and Pa’s, the world of domesticity and the world of the outdoors. While book version Ma was horrified that Laura might go help with haying, the real life Caroline went into the fields herself to help as a matter of course. While book version Ma objected to Laura working in a hotel in De Smet, Caroline had both her older daughters working with her in the Masters Hotel in Burr Oak, Iowa. On the NBC TV series, Karen Grassle portrayed Ma Ingalls. Grassle’s version of Ma was calm and soft-spoken with a small fiery streak absent from the books. Her rivalry with the TV show’s Mrs. Oleson (portrayed by Katherine MacGregor) was a regular feature of the show, especially in the early years (“Really Charles, THAT WOMAN!” – pick your episode). Still, it was Grassle’s calm assurance that made many TV viewers feel that they too were safely part of the Ingalls family. 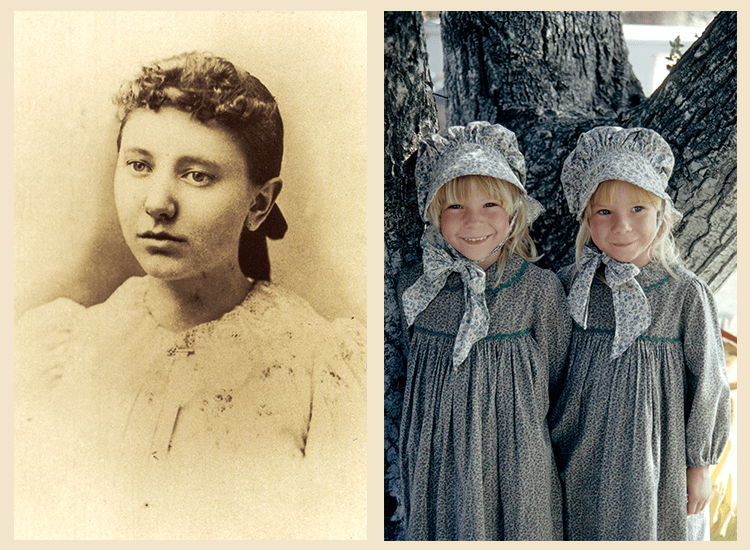 Mary was literally the fair-haired child of the Ingalls family. As the oldest sister, she was studious and enjoyed music and crafts. Her independence and future were sharply curtailed when she lost her sight at age 14. This greatly impacted the whole family. Laura had to step up and take more responsibility. The family sacrificed to get their share of the money needed to send her to the Iowa School for the Blind (support including money for tuition and books also came from the Dakota territorial government). As it did for many people, the school restored a lot of Mary’s self-confidence. After she graduated, she returned to live with Pa and Ma in De Smet, South Dakota. After Pa’s death, Mary continued to live with Ma in the Third Street house until Ma died. Mary went to stay with Carrie for a long visit, suffered a stroke, and eventually passed away while still in Keystone, South Dakota. In the books, we saw a sharp contrast between Pa/Laura and Ma/Mary. However, some things Mary did and said in real life according to Pioneer Girl or the “Missouri Ruralist” stories were in line with the established character of Laura. They were changed in the books and given to the Laura character, perhaps to accentuate this contrast. Melissa Sue Anderson played Mary on the TV show from 1974-1981. They delayed the onset of Mary’s blindness for fear it would limit storyline options. Her time at the blind school was extremely truncated and she met the fictional creation Adam Kendall who served as a teacher at the TV version of the school. Mary and Adam married and taught at the school. They weathered the school burning down, their baby dying in the fire, and finally, Adam regaining his sight and becoming a lawyer before they were moved off of the series. In real life, Mary never married nor taught school. Laura was both a pioneer and an author. She helped her family create a homestead, worked as a seamstress and taught school before marrying Almanzo James Wilder. They set out to build their own farm. They had several failed attempts before finally making a last fresh start in Mansfield, Missouri. They were able to improve their farm slowly until they had a modestly successful farm of over 200 acres. 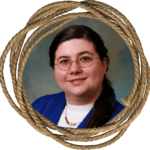 Laura’s work sharing information to improve farm life led to a semi-regular career writing mostly magazine articles for the Missouri Ruralist. 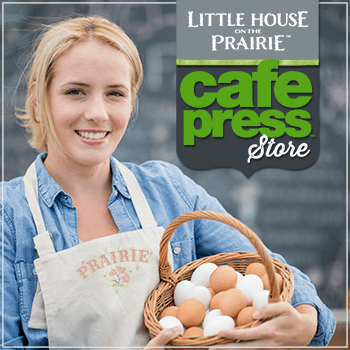 Her own ambitions and her daughter Rose’s prodding led her to write and publish a fictionalized account of her childhood in the Little House books. The process of creating the series and later answering her fan mail would be her big project for the rest of her life. Laura is the voice of the stories both in real life and in the books. She changed details and events to make a better story and to keep Laura front and center. As an example, Laura told her daughter Rose that in real life Pa never would have taken her to see the work on the railroad because it was a place where men swore and had no private bathroom facilities. Her description of the railroad work in By the Shores of Sliver Lake was from second-hand descriptions from Pa and Almanzo. She also moved around events and combined actions of various real people to make the story. For example, the character of Nellie Oleson is a composite of Nellie Owens, Genevieve Masters, and Stella Gilbert. The books are a fictionalized account of her life, but definitely ARE the story of her life. On the TV show, they shift more focus on Pa and add episodes that focused on other families around town. However, Melissa Gilbert’s Laura is still a key character. She has a much more adventurous life than either real life or book Laura. In the TV show Laura is kidnapped, travels to see the Pacific Ocean, is trapped in an abandoned cabin during a blizzard, thinks she’s discovered a gold mine, pushes Nellie Oleson down the hill in a wheelchair, runs away to the mountains and forms a close connection with a man who may or may not be an angel, among many other adventures. 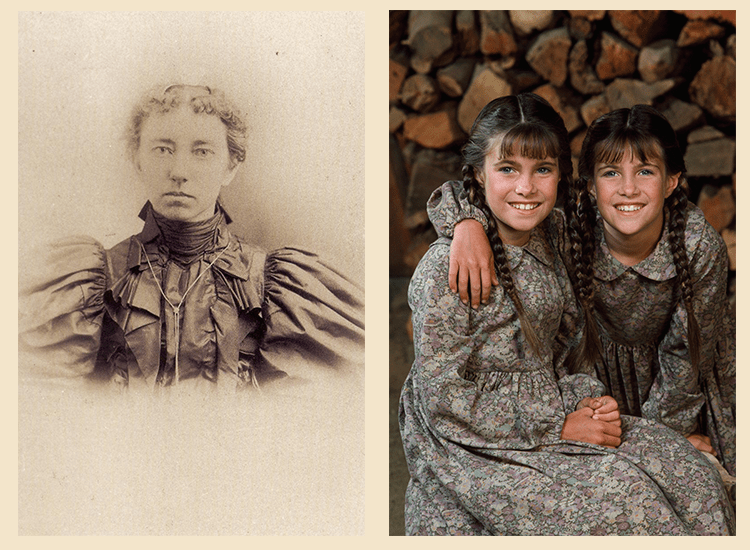 Carrie is the Ingalls family member whose life might be the most surprising to fans. She worked at several jobs before getting a job at the newspaper in De Smet. Carrie found her niche in newspapering and was hired by E.L. Senn who ran a syndicate of newspapers in Dakota Territory. She homesteaded, which she completed by preemption, near Phillip, South Dakota and married widower David Swanzey. She would spend the rest of her life in Keystone, South Dakota, near Mt. Rushmore. In the earlier books in the Little House series, Baby Carrie is noted for clapping her hands and banging her cup, but about the time of By the Shores of Silver Lake Carrie emerges as Laura’s new partner as Mary’s actions are limited by her blindness. It is Carrie who runs across the frozen lake with Laura, Carrie who is with Laura when they get lost in the slough before they find Almanzo in his hayfield, and Carrie who goes with Laura to buy Pa’s Christmas suspenders during The Long Winter. In the final books, Laura’s attention turns away from the family towards jobs, her circle of friends, and of course Almanzo, while Carrie fades into the background. By the time the series ends, Carrie is still a young teen and we never really meet her as a grown up. On the TV show Carrie, portrayed by twins under the stage names of Lindsay and Sidney Greenbush, is best known for falling down during the opening credits and the two Carrie-centric episodes, “Little Girl Lost” Season 3, Episode 4 and “The Godsister” Season 5, Episode 15. She fades into the background for the second half of the series. Grace was born 10 years after Laura, Grace is still very young when Laura’s attention turned outside the family and was only 8 when Laura left the family to get married. In real life Grace graduated from normal school, taught school, and married local farmer Nat Dow, moving to Manchester, the next town down the railroad from De Smet. In the books, as Carrie grows up, Grace is born and takes on the role of youngest sister. She is known as Baby Grace. Grace’s two most memorable turns in the books are when she wears the swan down coat with the blue lining that Ma made for her and when she is lost and found in the fairy ring of violets. She never really gets much of a personality in the book series. Grace, also arrived later in the TV series, played by Wendi and Brenda Turnbaugh from 1978-1982. She was an infant or a toddler during her run on the series. The only Grace-centric episode is if you count the one when Caroline obsesses on how she wants this fifth child to be a boy. The son of a successful farmer, Almanzo wanted to build a successful farm of his own. Born in New York, Almanzo moved with his parents to southeastern Minnesota and then sought his own land further west. While in De Smet he met and married Laura and they began work towards their goal. Their first attempts were defeated at every turn. They made one last fresh start in Mansfield, Missouri, and slowly were able to build a modestly successful farm. His stories helped inspire his wife’s books. In Farmer Boy, Almanzo got his own book. 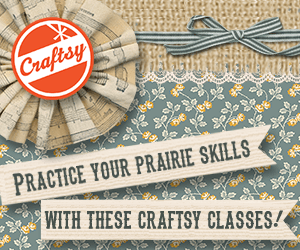 The book explores a different world from Laura’s prairie tales. Farmer Boy is set on a successfully established farm in Upstate New York. It’s known for its detailed descriptions of all the different things he had to eat. Laura erased Almanzo’s oldest sister Laura to prevent confusion with readers. Almanzo doesn’t reappear until The Long Winter starting the slow lead up to his marriage to Laura when they create their own “little gray home in the west” providing the happy ending of the book series. Unfortunately, that happy ending didn’t happen in real life and the next few years would be some of the most challenging in the Wilder family’s life until they finally got to their real happy ending in Mansfield, Missouri. 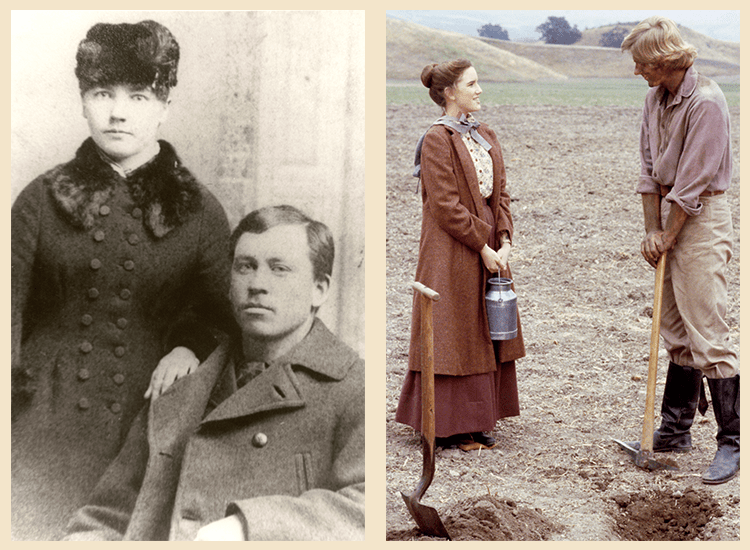 Another change was made in the books related to Laura and Almanzo’s age difference. In real life, Almanzo was 10 years older than she was, so Laura invented the whole bit about Almanzo not really being old enough to file on a homestead when, in fact, he was old enough. Dean Butler played Almanzo from 1979-1984. Dean has said that it was a role he took seriously to make sure people felt that Laura would be safe with him. They actually kept the age difference more true to life than it was in the books. Dean was about 8 years older than Melissa. On the TV show Laura knew she wanted Manly from the beginning and he, quite rightly, saw her as still a little girl. Getting him to see her as an adult was a major storyline of the series. The details of the lives of Almanzo and all his relatives were changed a lot for the show. However, most of the storylines were very loosely based on fact. Tragedies like the death of Laura and Almanzo’s son, their house burning down, and Almanzo’s illness (except the wheelchair story) were based on things that happened. However, the entire story about Laura and Almanzo living in a giant white boarding house with a British author were figments of Landon’s imagination. 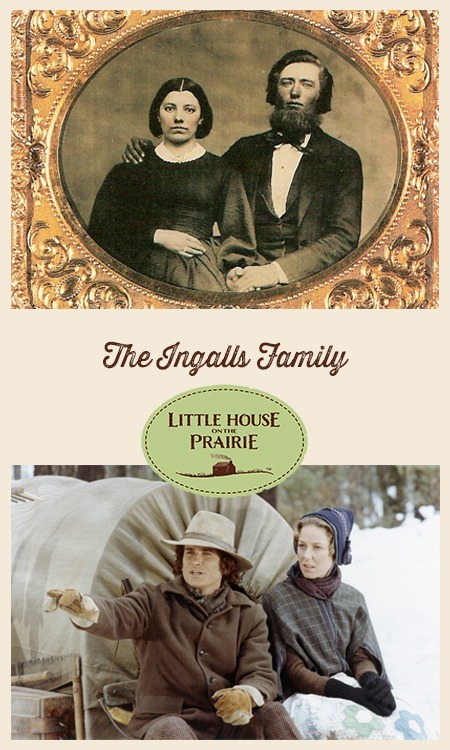 No matter what version of the Ingalls family you know best, explore this site to learn about the other versions of your favorite family. Sarah S. Uthoff is the main force behind Trundlebed Tales striving to bring the History, Mystery, Magic and Imagination of Laura Ingalls Wilder and other greats of children’s literature and history to life for a new generation. 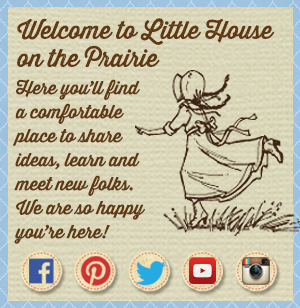 Uthoff is a nationally-known Laura Ingalls Wilder authority and has presented at five of the Wilder homesites, many conferences and numerous libraries, museums, and events around the Midwest. No, James and Cassandra never existed. They were made up for the TV show. Where can I get these book. 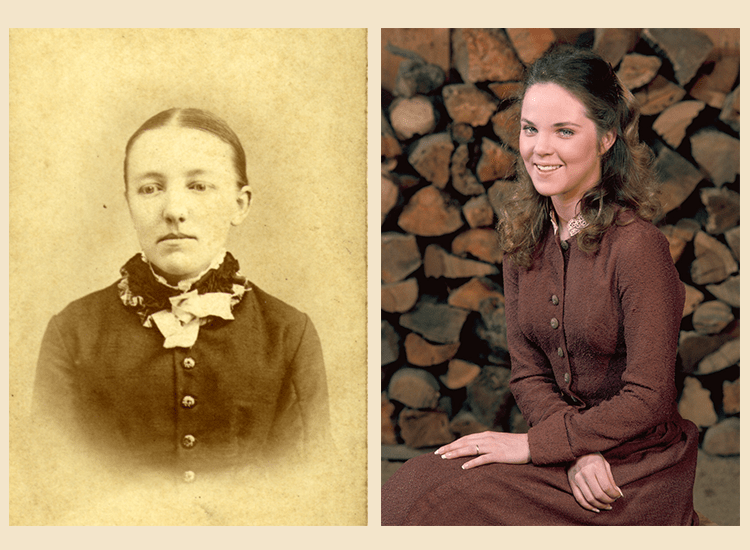 Can you tell us about Albert Ingalls on the tv show and Freddie Ingalls in real life? Hi Sarah, My name is Jim Lusk and I am a tour guide at the Wilder home outside of Malone, New York. If you check the census records you will see that Almanzo really did give his age incorrectly to be able to stake his Dakota claim in 1879. The census records for 1860, 1870 and 1875 all indicate that he was actually born in 1859 not 1857. It was only his statements about his age and his grave stone that says 1857 was his birth year. We do not talk about it at the sight or dwell on it because it is not really a big deal. But I wanted to share that with you. Thanks for all you do for the Laura lovers! I had a book about the Ingalls family about 10-15 years ago.I ended up losing it somewhere between here and there when I moved.It told the story of all the family members starting with when Charles moved from N.Y. to Wis.,Caroline when she taught the first kindergarden in Watertown,Wis,things they did and places they went as kids themselves as well as their move to De Smet,S.D. after they married.It also told when each child(including their son who only lived a short time)was born and what they did while growing up.Can any-one tell me where I can find another copy of this biography? Hi sarah . my name is zahra. I am persian . now “litte house ..” is showing in my country ,s chanel. I m very happy for find this website.